You Didn’t “Miss” Michael Kors! Think you’re too late on Michael Kors? Think again. This extremely popular brand is likely still in its infant growth stages. So, you missed the boat on Michael Kors Holdings (NYSE:CPRI) If so, then you might be hanging your head, but there's actually no reason to feel down. There is a common misconception among investors that they "missed it." The truth for many is that the winners keep winning, and Michael Kors is still in the early stages of its winning trend. In addition to consistently deliver strong domestic results, the company is now looking to increase its international exposure. But even if you just look domestically, it would be difficult to find another lifestyle-products company that's more on trend. Wait until you see some of the numbers and projections below. 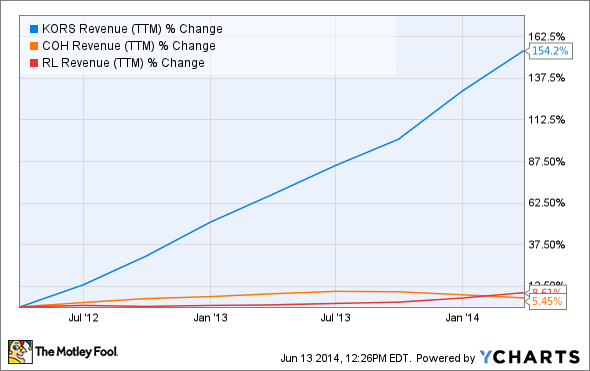 One of the first things Michael Kors states in its 10-Q filing is that it's "rapidly growing." This isn't something you often find in an SEC filing. These filings are meant to be objective and factual, and that's the case here. Michael Kors wasn't attempting to sell anyone by referring to itself as rapidly growing. It was stating a fact. Another hint at the likelihood of impressive future performance is that it increased its full-price retail store count and outlet store count by 38.8% and 22.3%, respectively, for fiscal-year 2015 (year over year). An increase in store count alone doesn't promise strong future performance, but such significant store count increases show that the company is highly confident in its future prospects. A third hint at the likelihood of future success is the company's outlook for fiscal-year 2015. Comps sales (sales at stores open at least one year) are expected to increase in the high teens (percentage-wise), and diluted earnings per share are expected to come in at $3.85-$3.91 compared to $3.22 in fiscal-year 2014. To get a better idea of the dominance of Michael Kors, consider some key comparisons. Michael Kors is currently trading at 29 times earnings, making it moderately more expensive than Ralph Lauren and Coach; but given the comparisons above, it looks like paying a premium for Michael Kors would be more than justifiable. However, if you're a dividend investor, then you might prefer Ralph Lauren or Coach, with current yields of 1.2% and 3.4%, respectively. 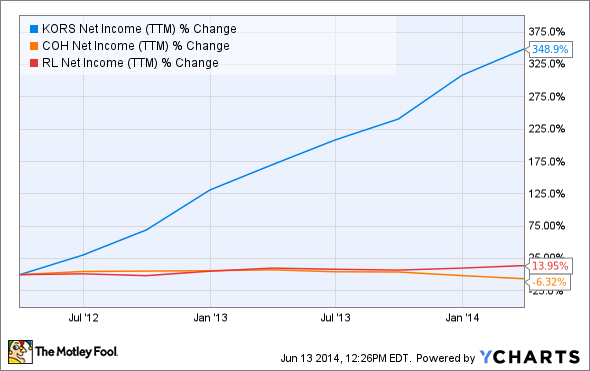 Michael Kors doesn't pay a dividend, which makes sense given its substantial growth potential. In the fourth quarter, Michael Kors delivered a revenue gain of 53.6%, a comps gain of 26.2%, and diluted earnings-per-share improvement of 56% year over year. All three segments -- retail, wholesale, and licensing -- delivered significant net sales gains: 49.7%, 55.5%, and 79.1%, respectively. If you break the quarter down geographically, North America revenue increased 43%, with comps popping 20.6%. This was primarily thanks to strength in accessories and watches in retail and strength in footwear and shop-in-shop locations in department stores in wholesale. In Europe, revenue skyrocketed 125%, with comps shooting 62.7% higher. This was primarily due to increased brand awareness. The numbers above should be exciting to any investor. In addition to the likelihood of continued strength in the U.S. and Europe, Michael Kors plans to increase its global presence in non-established international markets. Given the success and momentum already seen by Michael Kors in established markets, you can only image the growth potential. If you're looking to invest in a lifestyle-products brand, then you will be hard-pressed to find a better option than Michael Kors. When investing, it's best to go with what's working and stick with it until it doesn't work anymore. In the case of Michael Kors, there should be a very long runway ahead, perhaps not just years but decades before another brand comes along and steals its thunder.